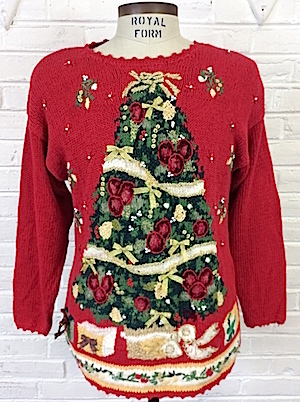 Home > Items just added 4/3-4/17 > (Mens M) Ugly Christmas Sweater! Glitzy Xmas Tree W/ Glittery Gold Bows & Beads! Condition: Very Good. Has some red color bleed in a few of the white areas of the sweater. Does not detract from the awesomeness of this sweater. Sleeves: 28" collar to cuff. 3/4 Length sleeves.